The Interior Features That Come With the Dodge Challenger: Which Ones Will You Choose? 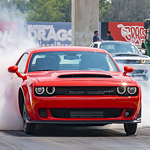 The Dodge Challenger is a popular model at Team Dodge in Huntsville for many reasons. Our consumers prefer this model because it offers versatile features that make it a unique muscle car. Read further to learn about a few interior features that are available with the Dodge Challenger. The Challenger offers the available Uconnect 4C NAV system. With this infotainment system, you get numerous features that include hands-free calling, a 4G LET Wi-Fi hotspot, integrated voice command, and Navigation. This infotainment system also comes with Android Auto and Apple CarPlay, so you an easily connect playlists and apps from your smartphone to the 8.4-inch Uconnect touchscreen. You can choose high-performance seats with the Challenger that are designed to fit to the contour of your body for a comfortable and secure driving experience. You get best-in-class passenger room and class-exclusive five-passenger seating to keep everyone in the car comfortable. The Challenger also comes with best-in-class cargo volume.